2004 was the year I got my first puppy. 2007 was the year I started the Puppy In Training blog. Are you thinking about getting a new puppy? If you haven’t raised or trained a puppy in the past then you should consider whether or not your have these 3 traits because if not you may be in for a world of hurt with a new puppy. Let’s take a quick look at why these traits are so important. Consistent – Lucky for me I read several books and scoured the internet before picking up Linus from the animal shelter. I already new the importance of being consistent. Why consistent? If you are not consistent then your puppy will be confused as to what is right and wrong. For instance, lets say you are teaching your puppy his name and you expect anytime you say his name he comes back to you. If you say his name and he doesn’t return to you and you don’t do anything to enforce the command then your pup has just learned that his name doesn’t mean return to mommy (or whoever said his name). I hear this all the time. My puppy doesn’t return to me when I say his name. I can almost guarantee the reason is you are not being consistent in enforcing the command. Persistent – Training a puppy can be difficult. Sometimes it seems like your puppy just won’t get it. I came across the importance of persistence when I was crate training my first guide dog puppy, Stetson. Lets revisit the definition of persistent: “continuing to do something or to try to do something even though it is difficult or other people want your to stop.” The second or third definition could be “crate training Stetson.” When crate training puppies you almost always have to put up with a little bit of barking/crying/howling. Most of my pup’s would bark for 5 minutes or less than fall asleep. This would usually continue for no less than a week with most puppies. Many would think that alone would define persistence, but lets take a look at Mr. Stetson. A short recap: Stetson basically cried for about 15 minutes in his crate while I talked him to sleep and woke up about every 2 hours crying for nearly a month. The good news was after about a month he was a perfect puppy in his crate, but it required a persistent puppy raiser to get him there. Patient – Puppies are frustrating! Sometimes it seems like they are doing things just to test our patience. After 10+ years raising and training puppies I’ve learned that I just have to be patient and our puppy will eventually learn his lessons. Lets look at an example when your patience will be tested. Some people seem to expect that an 8 week old puppy should already be potty trained. However, this is far from the truth. Most puppies at that age do not have full control of their bladder and will almost always have accidents at random times. For instance, puppies will often go pee at their regular potty spot and then almost as soon as they step foot in the house they squat and potty again. My answer to this craziness: At 8 weeks your puppy does not have full control of his bladder and sometimes does not know he did not get it all out. Be patient and wait a few minutes outside with your pup after he does his first tinkle there may be a second or third one coming very soon. When potty training your puppy you need patience. It takes time for your puppy to not only physically mature, but also to understand what, where, and when he’s supposed to go. Consistent – One of the main staples of a good blogger. If you’ve read any blog about blogging, taken a course on blogging, or read any books about blogging, blog experts will all mention the importance of being consistent. Most will say that bloggers should have a schedule using either a spreadsheet or editorial calendar to schedule posts by day even going as far as having a theme for each day you blog. In the past I was very good about being a consistent blogger, but the past year or 2 or 3 I slipped off the path and unless you consider one blog post about every other month consistent then I am failing. What happens when you’re not consistent? It’s simple, consistent bloggers have a consistent readership. As I slacked off on my consistency my readers stopped visiting, interacting, and subscribing to my blog. Why? Because they have no idea when I will post a new blog article. Even when I do post I imagine it just passes through their blog readers or email inboxes without a second look (because they likely forgot about me) and that’s if they remained subscribed to my blog. Look no further than my email newsletters which has never been consistent. It’s a double opt-in list so all subscribers come to my site, fill out the form, then confirm their email address a second time through email. However, because I don’t send out a consistent newsletter many forget that they signed up and even get upset when I send them an email. Persistent – “Trying to do something even though it is difficult…” I was as persistent as they come during my first 5 years of blogging. I stuck to my schedule rain or shine. I would put together a series of posts that would go live while I was on vacation in attempt to stick to the schedule. I made it a point to write (not necessarily a full blog post) every night from 10-11pm. Blogging is not always roses and rainbows. There are difficult times. You might have to write while on vacation, when you’re sick, when you’re tired, miss a dinner or party. What happens when you’re not persistent? Simple you cannot be consistent without being persistent! Scroll back up and see what happens when you are not consistent. Patient – Some people hear about blogging and expect traffic, fame, and riches from day 1, but when day 30, 60, 90 have hit and you’ve had only a small uptick in traffic? Many end up quitting before even starting. A successful blogger needs to be patient. I started this blog in July 2007 and it wasn’t until February 2008 that I really felt I was making some progress. Until then I was positive all the traffic was coming from my mom, girlfriend, and occasionally a few other members of the family. And why not…in the early days I emailed my mom, dad, brother, sister, and girlfriend after every post and asked them to leave a comment. 🙂 I would end up with 1-2 comments and maybe 5 visits. Back then that made me pretty happy. What happens if you are not patient? I’ve seen it many times over. Bloggers who are not patient fail in 30 days, 6 months, or a year. They want a windfall immediately and when it doesn’t happen they quit. I feel lucky that my blog started to see an uptick after 7 months. I think I had a fast rise and that was over 8 years ago when the competition in the blogosphere was not nearly as fierce. Be patient young Padawan, blogging is a marathon not a sprint. That’s all folks! Time for me to apply this to my every day life. I pledge to be consistent, persistent, and patient with my puppy raising and blogging. How about you guys? What do you think are important traits for puppy raisers? bloggers? Tell us your thoughts in the comments section below. Many forget that consistency is forever. I’ve been partnered with a service dog for over three years. If I don’t consistently review his obedience and task training, he chooses to forget or pretend the rules no longer apply. These dogs are super-smart, and if they aren’t regularly working and learning they get bored and act out. That’s a great point Kathryn! Training is an ongoing process and therefore remaining consistent, persistent, and patient throughout the lifetime of your dog is very important if you want a well-behaved dog. Thanks for stopping by! It’s always good to hear from you. Colby, I am so pleased by your commitment to the blog. I have a three year old Lab that is my fifth dog to raise and train. In the past I had read books, went to dog training classes and worked very hard at doing my part to have a well mannered dog in the family. I even won first place obedience awards. Then along came eight week old Levi, the chocolate lab. It had been 16 years since my last puppy and, of course, he proved to be the most challenging! I found your blog and so enjoyed the wisdom, encouragement, and humor. Your shared experience with crate training Stetson kept me full of hope as I listened to my puppy insist he was going to die if I didn’t open that door and hold him! It wasn’t long before he retreated to the crate for a nap! I spoke of your blog to anyone with a dog! It was frustrating and disappointing as the blog lost steam. I took to re-reading posts. Thanks for your commitment to the blog and your willingness to answer questions!! I so look forward to enjoying your blog into the future! You just made my day! Thank you so much for expressing your appreciation for the blog! I’m glad Stetson’s crate training story helped you stick to your guns when you were working with your puppy. It’s been a while since I first wrote about Stetson. He will be 9 at the end of the year and Linus will be 11. Also, we will likely have another service dog puppy in training coming to the house soon. You’ll hear more about him in the coming days. Again, thank you for your wonderful comment. I hope to hear from you again soon! 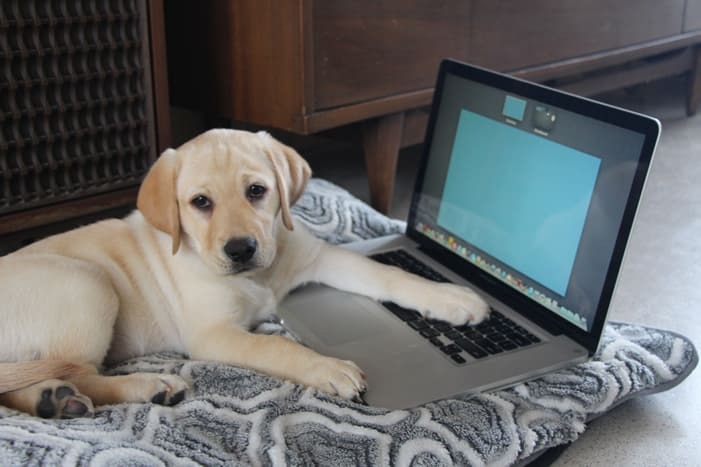 Love the comparison between raising puppies and blogging. I have a cat and knows how it’s hard to train her to do what I needed. At the end of the day, you learn to accept the imperfection, that things would not always progress as fast as we wanted. The most important thing to blogging or anything to me, is to keep reminding yourself why you do it. For example that I enjoy my cat’s company, and sharing useful content. These reasons are the root of my actions. Good point. I really enjoy helping others and that’s probably one of the big reasons why I raise puppies for people with disabilities.